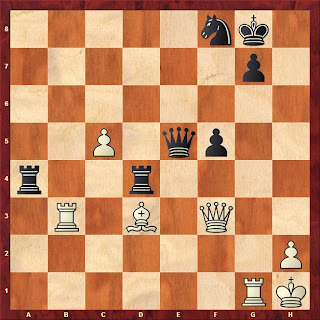 What would you play here with Black? 33...fxe3! offering a piece for what it turned out to be indeed good compensation; the game continued: 34.fxe4 accepting the sacrifice cxd4 35.Ng4 dxe4 and after a tough struggle and very entertaining ending, the game resulted in a draw. Despite the computer's suggestion, that after 33...fxe3 better was 34.g6 h6 and only afterwards to take the knight on e4, entering the same positions but with a slightly better version due to the pawn structure and the cramped Black's king, Turov's idea deserves credit and it doesn't make it less beautiful. 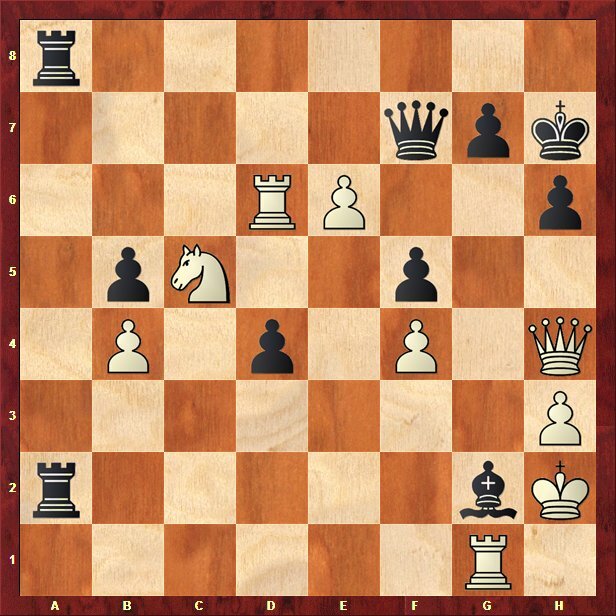 Practically speaking, it's very difficult to find these intermediate moves, especially when it looks so natural for White to simply take the piece. Black to move; how would you asses the position? 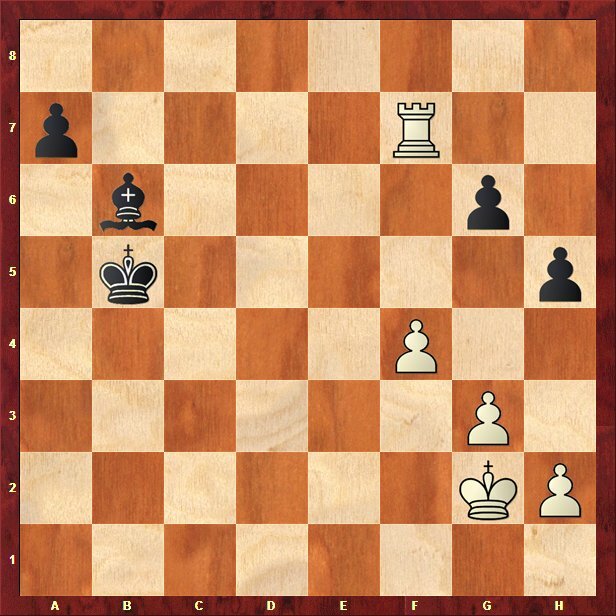 What would you play if you would have the Black pieces? It all started with: 51...Ra2! 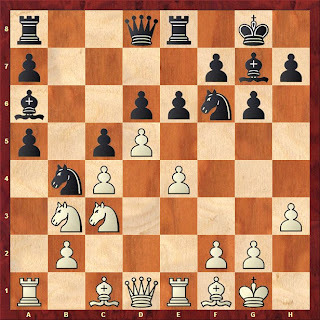 attacking on g2, so White has to play 52.Rg1 and now 52...Rfa8! bringing the last piece into play and getting ready for sacrifices on g2. What should White do now?! It looks like Black was better from the very beginning and now he should collect the point, right?! White cannot take back on g2 due to Rxg2, Qg6+ and the rook from a8 will have an important role in forcing the White king to surrender. 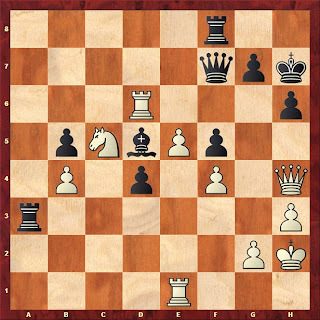 White cannot take the queen either 54.exf7, in view of 54...Bd5+ 55.Qf2 Rxf2+ 56.Kg3 Rf3+ 57.Kh2 Bxf7 and Black is two pawns up, plus attacking position. So than...what?! 54.Qxh6+! and after a couple of more moves, the game ended in a peaceful draw: 54...gxh6 55.exf7 Bd5+ 56.Kg3 Bf7 57.Kh4 and Black cannot protect the d4 pawn anymore 57...Rg8 58.Rxg8 Kxg8 59.Rxd4 and a draw was agreed. What would you play with Black? 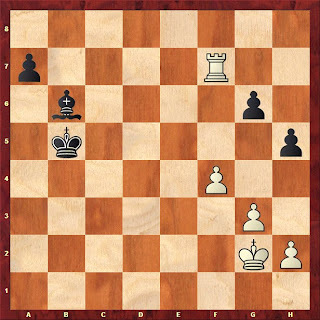 Can you still continue the attack with White? 28.Nf5! 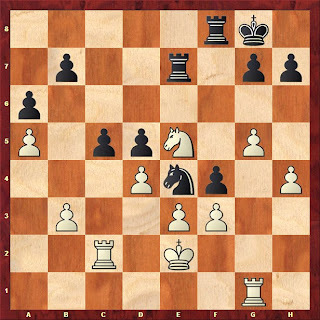 a beautiful thematic knight sacrifice; the game continued: 28...gxf5 29.exf5 Bxf5 giving back the piece, in hope for salvation; it doesn't help anyway, but what else?! 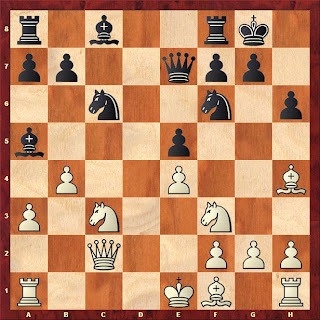 - White's pawns are way too dangerous 30.Bxf5 Nf7 31.Bxg7+ Kxg7 32.Qh5 Rh8 33.Be6 Bd8 34.g6 and the Black king cannot handle it anymore. 16.e5! dxe5 17.d6! and Vocaturo soon collapsed. 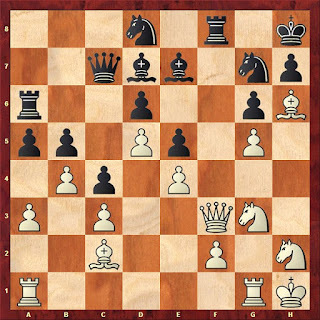 Black could have opposed tougher resistance by playing 16...exd5 and thus remaining in the game: 17.exf6 Rxe1 18.Qxe1 Nc2 19.Qd2 Na1 20.Na1 Bxf6 21.Nxd5 but White still has the upper hand. White is an exchange up and threatens to take on f7. How would you defend it? 54...Rc7! 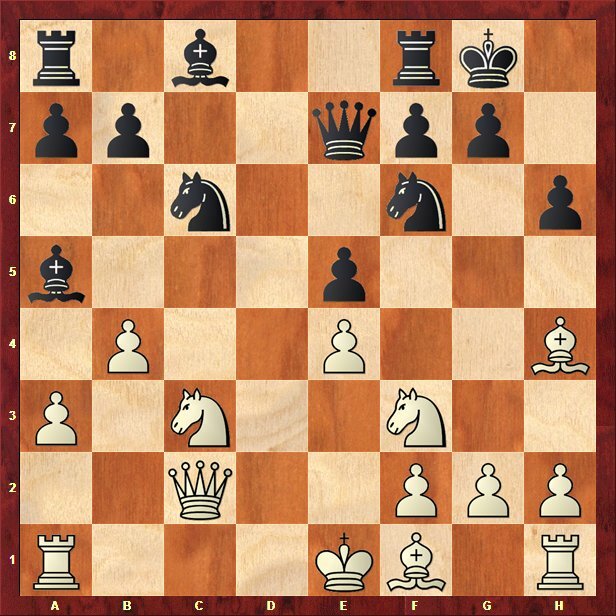 if you'll check with an engine, you will see that he immediately disagrees; objectively speaking, 54...Rc7 is not the most accurate move, in view of 55.f5 gxf5 and 56.Rh8 when Black's position becomes harder and harder to defend. So what's the point than? After 54...Rf5, White's plan is very natural and difficult to miss: Kf3, h3, g4, pushing the rook on a very passive square f6 and slowly but surely making progress without any risks. 55.Rd8+ Kc5 56.Rc2+ Kb5 57.Rxc7 Bxc7 58.Rd7 Bb6 59.Rxf7 White should be winning, right?! 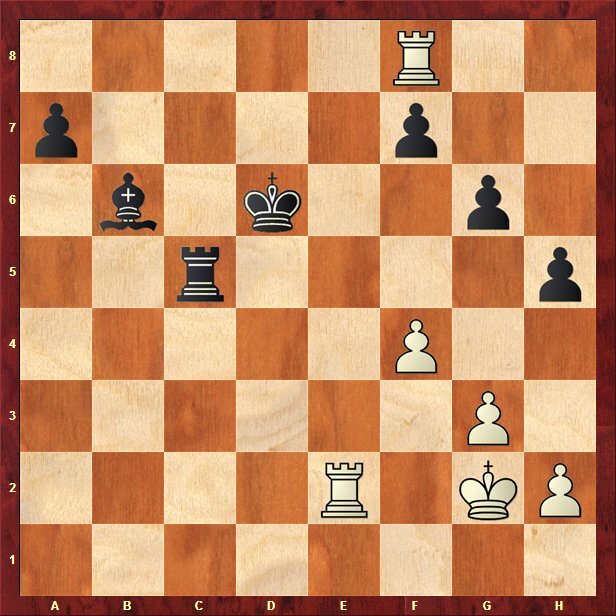 This is what Reinderman thought too and what Erwin was hoping for, devilishly inviting White to enter an endgame which is in fact: Draw! In the game: 59...a5 followed and it turned out that White cannot get more than a draw - the passed Black's a pawn has very fast legs and forced the rook to sacrifice itself in the hope for a win with the pawns from the other wing. But Black was just in time for a study like defense and went on to grab the hard fought half a point. White's last move was 40.Qf3, which is a blunder. How would you punish it? After many errors for both sides, playing under time pressure for long time, Radjabov reached the time control with his last move 40.Qf3? 41.Rg2 Rxg2 42.Qxg2 Rxd3 43.Rxd3 Qe1+ 44.Qg1 Qe4+ winning the rook and the game. It was a brilliant 'move' for Radjabov to offer a draw after 40.Qf3, when Van Wely had under one minute on the clock for his last move before the time control. Desperate measures were taken, but only thanks to the fastness in seeing that Qf3 was a blunder! Besides, he needed to react fast, before his opponent could realize what happens. A draw offer came, confused Van Wely and finally, with the seconds running down, the safest path was chosen: draw offer accepted! Bob Brozek, publisher rolex replica submariner involving "The Rolex Survey, " explained a lot of bogus designer watches are generally great illegal copies involving actual cigarettes. "Someone whom don't recognize your big difference can be confused for this enjoy. Perhaps a person fake omega who has proficient, this is the minor complicated, " Brozek explained. Brozek explained counterfeiters increasingly becoming greater in making true hunting fake scans. "It really does demonstrates these are receiving more replica watches uk complex. The idea demonstrates these are wasting more hard work using some parts. That they making the effort to identical cosmetically more consequently, " Brozek explained. Brozek explained counterfeiters are generally perhaps employing coloring copiers for you to disparaging offer off of replica rolex gmt the style involving legitimate Rolex packing containers. Imitations come in a great deal of spots. Your Troubleshooter grabbed false Rolex designer watches along with bogus Mont Blanc dog pens throughout South america. In the us, your Troubleshooter acquired bogus replica hublot Versace along with Chanel sun glasses, and also look-a-like Instructor hand bags. Throughout Tijuana, South america, customer Teresa Trucchi ordered a pair of Rolex duplicate designer watches. Though look managers told her your designer watches replica rolex daytona cant be found legitimate, Trucchi mentioned the girl may be confused. replica cartier get rid of that's why means a superb debt endeavor within your a part.